Eyebrows. They're a big thing of late, aren't they? Liz Hurley was always held up as a prime example of how eyebrows could completely change your face (that and a helping hand or three) but the big brows have had a resurgence in popularity over the past few years since starlets like Cara Delevingne (seriously can't pronounce that) started rockin' them with pride. 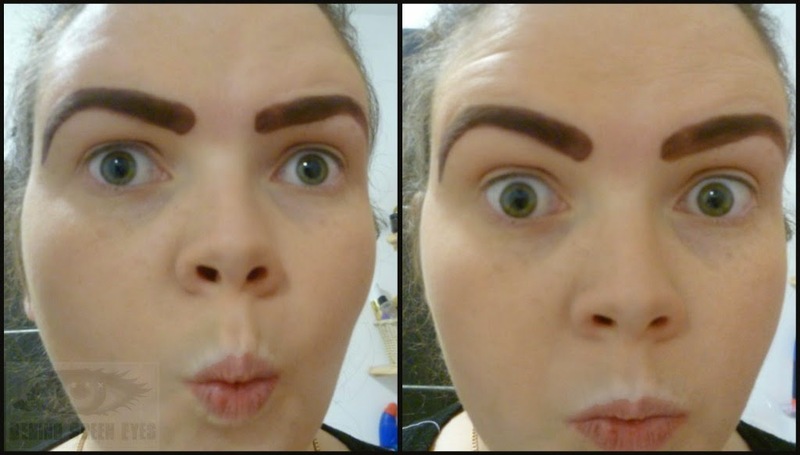 I've always tried to look after my eyebrows - I do believe they finish off your face and they can make a world of difference. If I only have time to do makeup very quickly, foundation and brow powder are the two I'll do. While Cara could probably glue a horn to her forehead and look beautiful, eyebrows can be tricky to get right if you haven't got a makeup artist on hand. 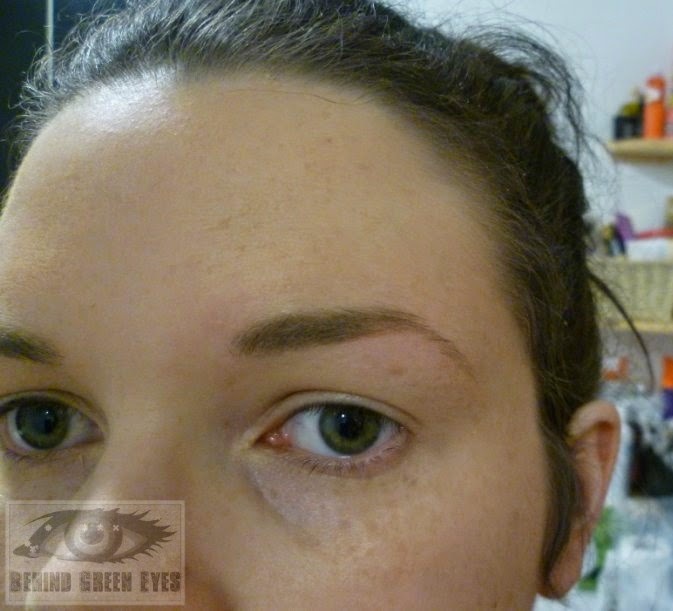 So, what can we do at home to make sure we end up with a Cara and not a Scouse Brow? There are loads of kits and stencils on the market - this little one is by W7 and cost €4 in Cara Pharmacy (the IRONY). 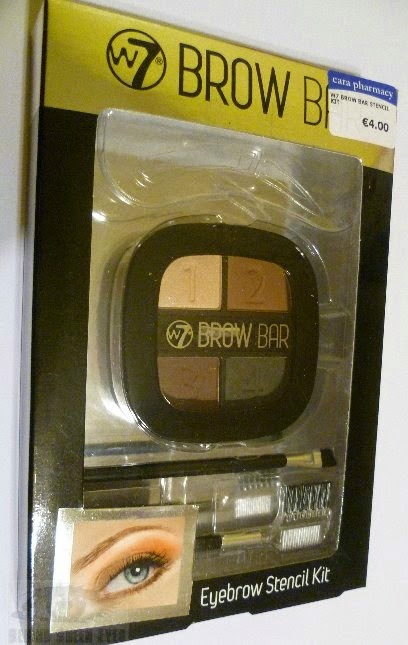 At first glance, I thought this was a really great little kit - 4 numbered shadows, an angled brush, a brow comb, and three sets of stencils. And the lovely eye on the front with the lovely eyebrow! Aye. Look at the back of the packet - there are instructions on how to use each element. 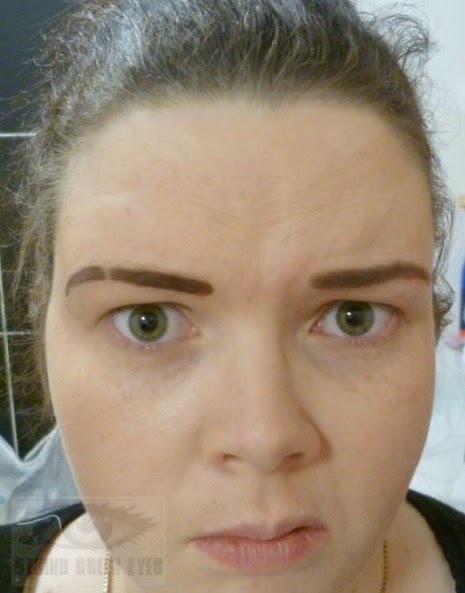 I thought the pale colour was to give a lift under the eyebrow, but apparently it's just an option for those of you who have eyebrows the colour of caucasian flesh. Spencer Pratt, maybe? Also - look at the spelling. LOOK AT IT. Fill wegiht? 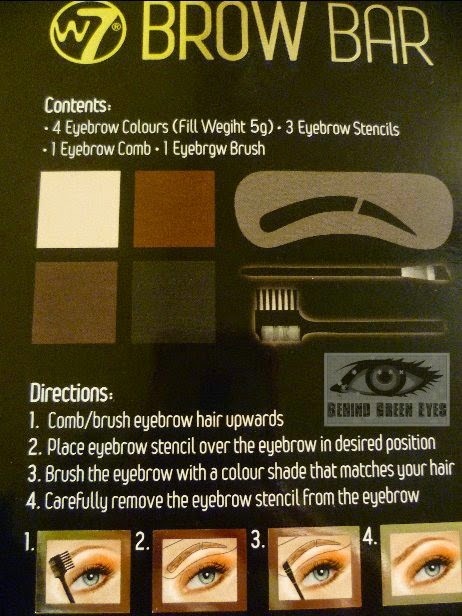 Eyebrgw Brush? Lord lantern jaysus lads. Whoever let that go to print needs a swift kick. Anyway - I said I'd give it a whack despite the numbers on the shadow meaning absolutely nothing, and the pointless addition of a second mini slanted brush in the shadow box. And here's what it looked like after using the smallest stencil. I think you need to see them both together. See how that nifty little bit of plastic right in the middle of the stencil helped give it a whole Shane Lynch circa 1998 look? The powder had so much fallout, I'd say it's mostly talc. I didn't bother with the medium stencil afterwards, I decided to go straight for the big guns. At this point, my husband walked in and nearly wet himself. Fabulous. I think I'll do them every day. I look like the girl from Hey! Arnold. Amazing!! 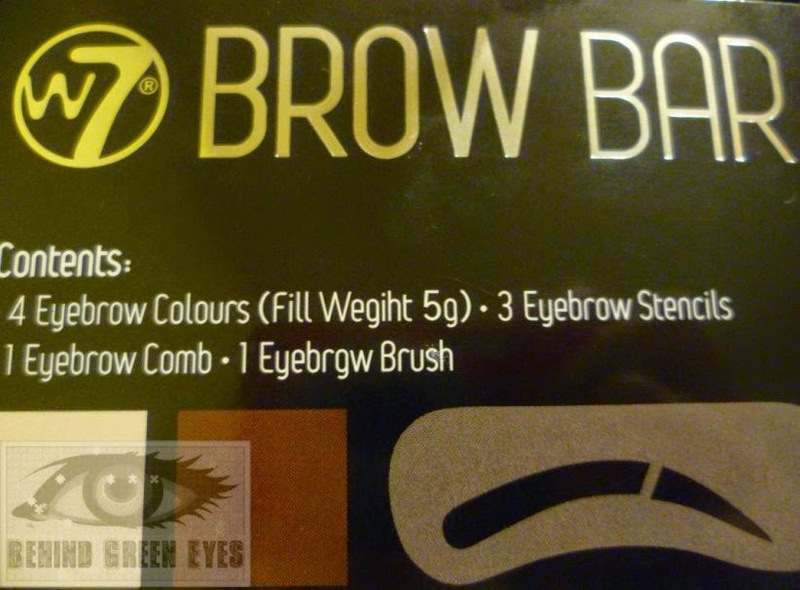 Loving the Shane Lynch brow! Somebody call Vogue :P Wow! The last ones are definitely my favourite I have to say. Nice and simple for daily wear ;) The spelling on the back is atrocious, I cannot believe they didn't notice at least one of them. Oh sweet LAWD in heaven, I almost choked on my Easter Egg looking at that Sharon you LOONatic Hahahahaha and Helga? Hahahahaha. Gold. That is a bad product lol! Glad it was only €4! Cara eat your heart out!! You are so funny! I love everything about this post!! I really think you deserve some sort of award for this. It's beyond funny. It's entered some sort of supernaturally hilarious realm. I'm hopped up on every form of chest infection medication there is but nevertheless I have laughed for a solid 15 minutes and had to leave the room, everyone started to side-eye me. Ohhhh god. I cried reading this. Is weeping with laughter a thing? Like wailing laughing. Had to leave the room, started to get the side-eye. So good. SO GOOD. ahAHAHAHAHAHAHAHAHA. Really helpful review on this! 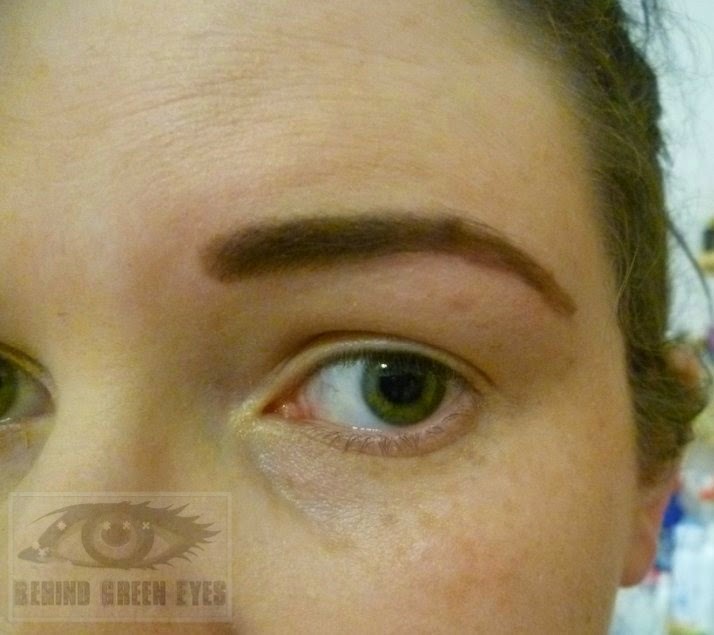 I may have wet myself a tiny bit with The Sharon 'Shane' lynch brow!! Deadly. Oh Sharon! 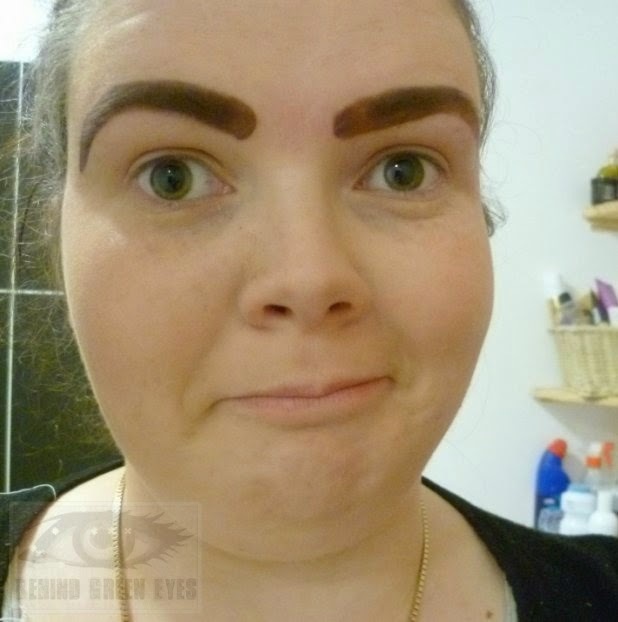 I shouldn't laugh but the eyebrows are just insane! This post made my day so much brighter!